With the heat wave continuing we are waiting on the signs of the apocalypse, but the question we are getting asked most often is how can I cool me wine faster? Fast:The freezer is a good starting point but it’s not the fastest way. Too much air and other things in there so the bottle isn’t completely covered in cold goodness! 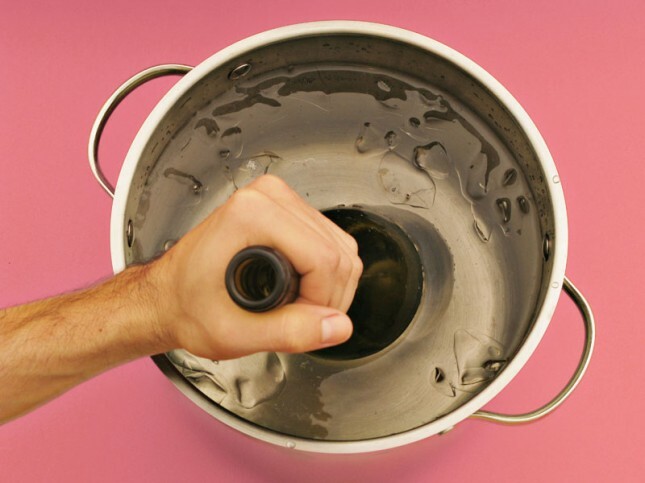 Faster: Add a gel sleeve to the wine bottle in the freezer. Getting something cold touching the bottle transfers the cold to the wine faster. Fastest: Get a bucket and fill it about half full of ice. Then add the coldest water you can get from the tap fill the bucket to about 3/4 full. Now you have something approximating the ice floes of the Arctic–in fact, add salt to the water to decrease the range of the water to below 32 degrees. Submerge the bottle in the bucket. Stir or swirl for fastest results, beware this leads to a different kind of red hands. Not all moms enjoy a glass of wine, but those who do will appreciate our selection of top 5 Mother’s Day wines. We’ve chosen a sparkler, a red, a white and a rosé, as well as a bottles on the sweeter side. Bring a bottle as a gift for mam to enjoy later or to share during a meal together. Lovely as and aperitif, perfect for celebrations, and an exquisite partner to the most delicate and sophisticated dishes.70% Prosecco di Valdobbiadene D.o.c.g and a 30% blend of local varieties. This sparkling wine honors the traditions of the Veneto winemaking region and the long history of the Mionetto family. Contemporary master vintner Sergio Mionetto produces this wine based on a formula handed down by Francesco Mionetto, who founded the winery in 1887. A touch of three old grape varieties, unique to the region, is blended with the area’s finest Prosecco grapes; the result is a superbly dry, slightly fruity wine with just a hint of acidic crispness. David and Nick use fruit from two of South Australia’s premium grape regions for this Shiraz. The Clare Valley component (75%) is all about power, structure and frangrantly perfumed fruit. The McLaren Vale portion (25%) is rich, licorice and chocolaty with a wonderful and sumptuous mouthfeel. These two components combine to produce a very complex wine displaying opulent aromas of mocha, plums, aniseed and spices. The palate is full and broad with deep, dark flavours of blackberries, plums, licorice and coffee, which are intertwined with some seriously good new and older French oak. This is an absolute go to wine. Made with 100% Bombino Nero, maybe the most unique red grape variety of the area, Castel Del Monte. Its thin skin, the uneven ripening of its bunches, and the grape’s high juice content, make it ideal for the production of delicate and fresh rosé wines. The only rosé in the area to achieve DOCG status, Italy’s highest award of regional recognition for wine. Fresh and delicate bouquet with notes of rose and cherry; fresh and fruity palate, well balanced by a lingering freshness on the finish. The 2010 Moscato is white gold. It has a fresh aroma of fruit salad, passion-fruit, pear, rose and grapefruit. The semi sweet palate has an uplifting frizzante with flavors of lychee, apple and ginger and a long lime finish. A wonderful fresh and not sticky sweet dessert wine made by Peter Logan in the style enjoyed by his sister Kylie. This is a wine that you can drink long after the desert has left the table!